Energy efficiency is one of the easiest ways to reduce your impact and make your home more energy efficient. Whether you are a home owner or a renter, learning how to make your home more energy efficient can reduce your water and sewer bills, reduce your electric bill and help make your home greener. It’s a win for your home, your wallet and our planet. Reduced water usage: water saving devices can reduce your need for water, but also your need for gas and electricity– reducing the amount of hot water wasted in the shower or sink reduces both water bills and gas/electric bills and reduces overall electric usage of your city as less water needs to be moved around, treated and flushed away. Learn how much electricity is used to move water! Reduced energy bills: Swapping incandescent bulbs, optimizing your appliances and following quick energy reduction tips can reduce your draw of electricity by a huge percentage but reducing the amount of energy needed to light the home, cool the home, do laundry and cook your food. Reduced gas bills: If you are cooking and heating with gas, reducing the amount gas used for the stove top and for the furnace, water heater and dryer will help reduce your gas bill and reduce our dependance on fossil fuels. We’ve mined all tons of research from years of writing across the Important Media Network to find you the best tips to make your home energy efficient easily and quickly! Got tips to share? Please share with us in the comments! The best way to make your bathroom more energy efficient is to reduce the need for water coming out of your bathroom. Not only is this saving water, but it reduces the need for water to be moved around. Think about this: water for your city comes from an aquifer or city water treatment plant, and then needs to make it to your house, which is usually done with electricity. This is a hidden cost of water, and one that makes a big difference in our overall electric costs. Learn more about the hidden costs of water in California from the Natural Resource Defense Council; many of the lessons learned can be extrapolated to other locales. But your direct water costs can be reduced by almost half by making quick switches with some simple hardware. Those some of these have an upfront cost– but like most home energy efficiency measures, they pay for themselves really quickly (how quickly depends exactly on your local rates). 1. High Efficiency Shower Valves: Most shower heads are 2.5 gallons per minute flow rates, and modern high efficiency flow valves can reduce that amount by half or more. Newer fixtures maintain pressure and don’t sacrifice water flow for efficiency like earlier models did. In fact, it will be hard to tell any difference after you swap them out! 2. 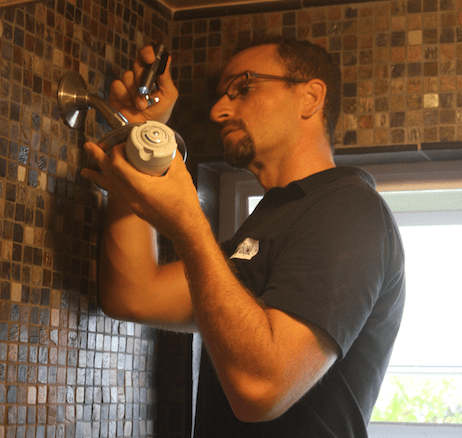 High Efficiency faucets: Just like high efficiency showers, high efficiency faucet aerators are easy to install and can reduce your water usage by at least half immediately. Faucet aerators are one of the cheapest options for reducing the water usage in your home too, making the payback period super fast. Also like high efficiency shower heads, newer models of aerators are designed to keep pressure high while reducing the flow, so you don’t need to sacrifice! Don’t forget to check for leaks for drips in your faucets, which can waste gallons of water a day. 3. Low Flow toilets: If you have a newer home, chances are your toilet is a dual flush (meaning it has one setting with less water for number 1, and more water for number two). If you don’t have a dual-flush toilet, you can install a flush convertor, which allows you to change settings depending on how much water you need per flush. The cheapest option is to install a tank bag, which simply displaces the water used in the tank to reduce the amount of each flush. Don’t use a brick in your toilet tank, as it can damage pipes. And don’t forget to check for leaks for drips in your toilet tank or supply line, which can waste gallons of water a day. 4. Bathroom lighting: Most bathrooms are way too bright. The brightness of a room can be measured with a lux meter, which can tell you how bright the room really is, and then you can compare to national standards of lighting needs. If you have a four or five-bulb vanity above the sink, you can probably unscrew at least two of them and still have a sufficient amount of light by which you can do all your bathroom activities. Swapping out the bulbs in the bathroom for LEDs will cut the usage drastically, and often you can leave some of the lights off with LEDs too. The kitchen is my happy place for making awesome homemade foods, but it’s where everyone can make a lot of home energy efficiency changes in as much time as it takes to make some cookies! 1. Tips for dish washing and dishwasher efficiency: If you have a newer dishwasher, chances are it’s pretty similar in water usage to hand washing dishes, but if you use the heated dry settings you’re wasting energy each time. The dishes will dry on their own if the dishwasher is left open after the wash cycle. Also, many dishwashers are programed to do very long washing cycles, so check the settings and tweak the settings to reduce running time to ensure you get the cleanest dishes with the least amount of time. If you’re a hand dishwasher, be sure to change your faucet aerator to reduce the flow and cut the water use exponentially (by half or more). 2. Oven & Stovetop: No surprise here, the oven is one of the biggest energy users in the kitchen! Unless you’re cooking a Thanksgiving feast for 10, most likely you’re not using the oven to its full capacity. You might benefit from a smaller counter top convention oven, which uses a good amount of electricity too, but heats up faster, using less energy overall. If you can’t get a smaller oven, use the tips to need to cook more efficiently in your oven. For your range, it’s important to follow the tips here for covering your drip pans and choosing the right coil size. We’ve also added some tips for alternative cooking options. 3. 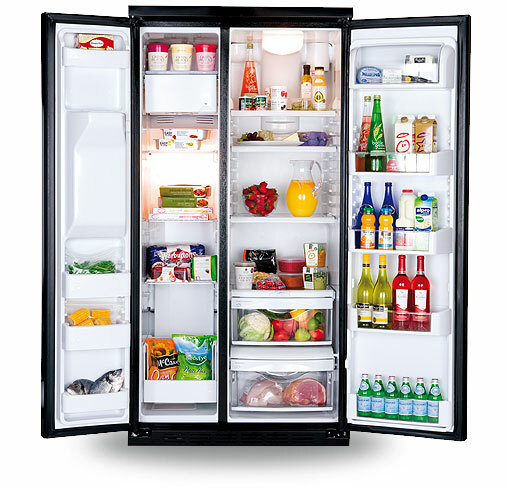 Fridge: Along with the stove, the fridge is one of the biggest users or energy in the kitchen, but it’s easy to cut the usage and drop your electric bill with simple tricks and tips to help your refrigerator run more efficiently and help you make the most of the energy you do use. The list below includes some quick tips that you can do right now to ensure your fridge is running the most efficiently. 4. Microwave: Microwaves are actually the most energy efficient way to heat your food. Some would argue the health merits of microwaves are dubious, but for efficiency they really can’t be beat for quick heating and warming of foods. 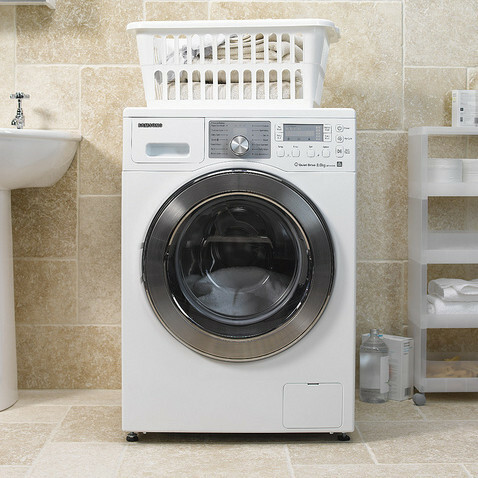 You may not have much choice about what type of washing machine and dryer that is available to you, but we have the tips you need to make it more efficient whether your laundry room hosts the newest model, or machines that are older than you’d like to admit. 1. Washing machine tips: Just as in the bathroom, wasting hot water in the washing machines wastes water but also electricity if the water is heated unnecessarily. Washing all your loads on cold/cold settings eliminates the need for hot or warm water, and most soaps are formulated for cold water anyway. Unless the stain is really bad, cold water will be just fine. 2. Energy efficiency for Dryers: Dryers are notorious energy suckers, and one that can eliminated entirely. The easiest way to reduce the energy use of your dryer is to simply not use it! Purchase some inexpensive indoor drying racks to hang up some or all of your laundry. These are cheap, easy to use, and especially if you live in a warmer climate, might be an even better option as clothes dry quickly and the dryer doesn’t need to heat up the home excessively. If it’s too cold where you live, you’re limited on space or you just can’t handle the natural crunchiness of line-dried clothing, making sure your dryer is functioning at it’s best to reduce the need for energy. Quick energy efficiency tips for dryers include: a clean lint trap and vent, a clean drying sensor, and using the auto-dry settings. 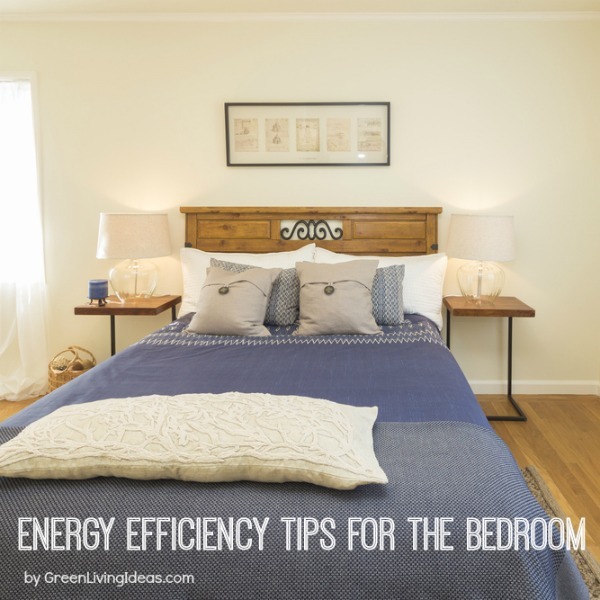 You may not think about your bedroom or living room being big users of energy, but there are actually a lot of ways of improving the energy efficiency of your bedroom and living room. Assuming you have lights in your rooms, it’s a good choice to swap out all incandescent and CFLs for LEDs. LED lights have a higher upfront cost than other bulbs, but they long term payout is totally worth it, as LEDs have a lifespan many times longer than incandescent and CFLs. Swapping out the lights will immediately reduce the electricity use in the room, and also keep it cooler during hotter months as incandescent give off heat every time they are turned on. And if you have fans in your rooms (ceiling fans or oscillating), know that fans cool people, not the room, so always be sure to turn the fans off before leaving the room. For other rooms in the home, all the same information applies. For living rooms, game rooms and other rooms there are lots of tips for reducing your impact there too! If you’re a gamer, there are easy opportunities to reduce the energy use. Turns out that gaming consoles use a ton of energy– most of it while they are in standby mode, which is their default ‘off’ mode. Most consoles make it really difficult to turn fully off (having to recalibrate or reconnect if turned off), but it can save you valuable dollars. Gaming consoles are also the most inefficient way to watch a DVD; choose a DVD player or laptop instead. Your TV, DVD players and other devices also use what’s known as vampire power, so use a power strip or a smart strip to make sure everything is really off. Batteries, which are used in gadgets and remotes all throughout the living room and the rest of the house, are not necessarily energy hogs for your electric bill, but it’s a good green initiative to choose reusable batteries to reduce your overall waste. Reusable batteries can be recharged for years, saving you money in the long run. Need more resources to make your home more energy efficient? We’ve got you covered.